Whether your goal is to get bigger and stronger, or improve power and explosiveness for sports, you want to see progress — and pronto. But building muscle efficiently requires more than just putting in time at the weight rack. Along with your strength training regimen, diet and lifestyle choices all play important roles. But before you even start thinking about how to build muscle, it’s instructive to know the primary factors that determine just how much of it you can gain. These are the main criteria dictating increases in muscle size, or hypertrophy — and two of them are outside your control. Simmer down — we’re talking gender. The male persuasion unsurprisingly has a decided advantage when it comes to building muscle. That’s due in large part to far greater levels of testosterone and a higher red blood cell count among men than women, who typically have to go to more extraordinary lengths to gain size. Similar to the way it governs how much hair you get to keep, heredity determines how much muscle you can develop. Thanks to genetics, a segment of the populace is born with a higher number of type II, or fast-twitch, muscle fibers, which have the greatest potential for growth. The factor you can change — and the one we’ll spend much of this article focusing on — is the approach you take to your workouts overall. There are different protocols that distinguish lifting for mass from lifting for strength. Generally speaking, lifting very heavy weights in low volume is how to gain strength, and lifting moderately heavy weights in high volume is how to gain muscle. For those seeking tips on how to gain muscle, here are some strategies to get you started. “You can certainly build muscle with all types of moves, but a strong base in multi-joint efforts, at least some of the time, is a good idea,” says Michael Ormsbee, Ph.D., interim director of the Institute of Sports Science & Medicine at Florida State University. Science agrees: Compound exercises cause the greatest increase in testosterone, a key muscle-building hormone, according to researchers at the University of Connecticut. Now that you’re lifting weights, you need to consume more protein to promote muscle repair, recovery, and growth since amino acids (the building blocks of protein) are necessary to build muscle tissue. If you have ambitious muscle-building goals, such as committing to Beachbody’s Body Beast program, shoot for the higher end of the range by adding one or two additional protein-rich snacks to your day. Shakeology is a great way to sneak in additional calories and nutrients and contains 16 to 17 grams of protein (depending on the flavor). When you lift heavy weights or do explosive exercises like sprinting, you target the type-II muscle fibers we discussed earlier. But studies show that type-I fibers (a.k.a. slow twitch — the kind used in endurance activities ) also have growth potential, so don’t ignore them. Once every week or two, target those type-I fibers with low weight, high rep work (e.g., 3-4 sets of 15 or more reps per exercise). Or simply follow a Beachbody program such as Body Beast, 21-Day Fix, P90X, 22-Minute Hard Corps, or The Master’s Hammer and Chisel, which have that kind of variation built in. Shoot for a minimum of seven hours a night. Getting less than that on a regular basis can cause you to rack up sleep debt, which can put the brakes on protein synthesis (a.k.a. muscle growth) and increase protein (read: muscle) degradation, according to a study by Brazilian researchers. Plus, you won’t reap the full benefits of human growth hormone, the levels of which spike while you’re in dreamland. Have trouble sleeping? Try these natural tips on how to get good sleep tonight. You need to challenge your muscles to trigger growth, but you also need to be smart about how you go about it. If you increase the amount of weight you’re lifting too quickly, you’ll increase your risk of injury. But if you do it too slowly, you’ll shortchange your results or hit a plateau. So how do you strike a balance? Pay attention to the effort you’re exerting. 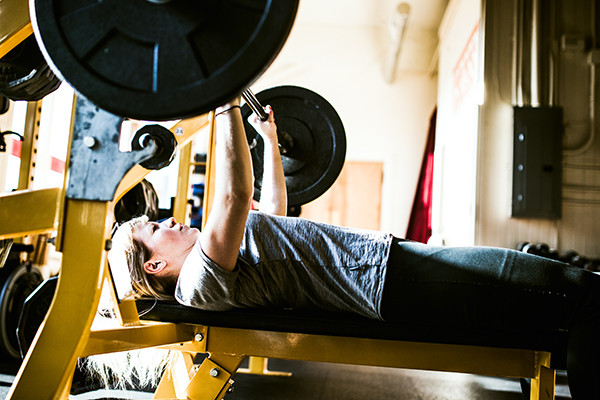 If you’re lifting with perfect form, and your last few reps an exercise feel similar to your first few, you know it’s time to reach for a heavier weight. Muscles grow between workouts, not during them, so make recovery a priority. In practice, that means eating healthier, consuming more protein, and not overtraining. Take at least one to two days off per week to allow your muscles to fully recover. “Training too often or at too-high an intensity too frequently — without rest and recovery — can actually hurt your muscle-building efforts,” says Ormsbee. Your move: Take at least one to two days off per week to allow your muscles to fully recover, and maximize the effectiveness of your downtime by doing light cross training (e.g. hiking, cycling) or activities like foam rolling and yoga. If you are patient, focused, and consistent with your workouts and recovery, you will see results. In addition to consuming more protein, there are a number of nutritional steps you can take to bulk up responsibly. “No one can be in a significant calorie deficit and gain muscle,” says Albert Matheny, M.S., R.D., C.S.C.S., co-founder of SoHo Strength Lab. To find out how many more calories you should consume to gain weight, determine how many calories you need to maintain your current weight — your baseline — then add 300. And if you’re following a muscle-building program like Body Beast, add the recommended calories outlined in the guide. Whether your calories come from carbs, fat, or protein goes a long way in determining whether your weight gain comes from muscle or from fat. An easy and relatively fast way to gain muscle is bulking first, then leaning out, which is the idea behind programs like Body Beast. Using this method, you only have to focus on one thing at a time — building, then getting lean, versus trying to increase mass while simultaneously limiting fat gain. To increase weight gained from fat, your macros should emphasize carbohydrates and fat, since it’s the most calorically dense macronutrient. The bulk of that fat should come from unsaturated sources such as avocado, olive oil, and salmon. Generally, you should consume about 20 grams of protein with some carbs shortly after a workout. One way to get the right mix is with Beachbody Peformance Recover, which combines time-released proteins and phytonutrients to aid recovery and reduce muscle breakdown. During the post-workout anabolic window, you’ll also want to limit fats, which can slow the absorption of protein. While there is some recent research that suggeststhe window may actually extend up to several hours following exercise, there’s no harm in getting nutrients in early as long as you’re sticking to your overall caloric and macronutrient goals. Can You Really Gain Muscle While You Sleep? A good night’s sleep can lead to great things: improved memory, sharper thinking, and feeling refreshed and being ready to take on the day. According to a recent study, it appears we can also add increasing muscle mass to the list of benefits that can be gained from a solid rest. A group at the University of Maastricht in the Netherlands ran a test to see if it was possible to increase muscle growth by eating protein before going to sleep. They took a group of men and placed them on identical meal and exercise plans for 12 weeks. Half of the men took a protein supplement before bed while the others took a placebo. At the end of the 12 weeks, researchers recorded the participants’ muscle growth and strength, and compared the data. The men in the protein-supplement group had significantly more muscle growth and strength than those who were given a placebo. Although the test group in this study was already consuming a diet high in protein, the results showed that ingesting additional protein before sleep helped with overnight muscle growth. This study used a supplement that was 27.5 g protein, 15 g carbohydrate, and 0.1 g fat, but an earlier study from 2012 found similar results when participants ingested just 20 g of high-quality protein (casein) before going to sleep. While frivolous night time snacking can lead to overeating, if you take a more targeted approach by eating a little protein just before bed, you may be able increase your muscle mass while you sleep.